Welcome to the party! I hope everyone is having a wonderful weekend! It is actually feeling like fall around here for a change. I love it. Thank you so much for joining the party this week! I am keeping this short and sweet, because my computer is not cooperating at all. I am using my husband's laptop, and it is so hard to type on when you get used to one computer! Our Home Away From Home shared a tour of her fabulous library. Oh, I love it! It is amazing. 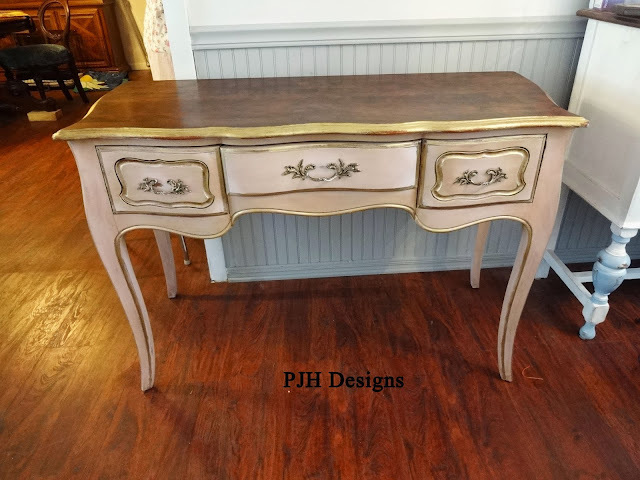 PJH Designs did a gorgeous job on this French Provencial Desk/Table makeover! I love the colors. 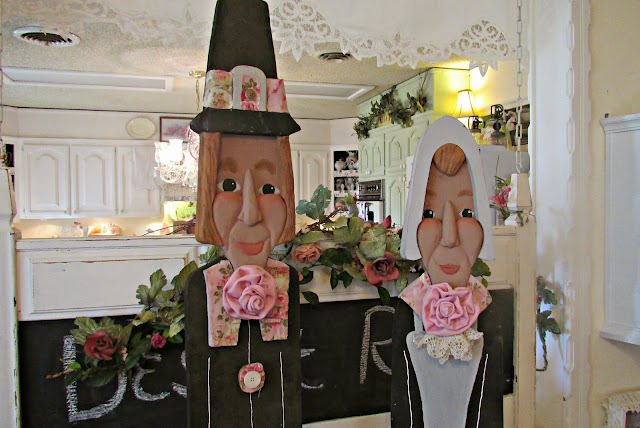 Penny's life size pilgrims from Penny's Vintage Home were also a huge hit at the party last week. How adorable are these pilgrims? Kathy, beautiful features again this week and thanks for the fun party! Thanks so much for hosting Kathy! Have a great weekend! As always, thank you for hosting a wonderful party! Hope you get your computer working! Fun party, so many great inspirations! thanks for hosting. Sorry it has been so long. Hi Kathe, thanks for hosting the party and have a great weekend and week. Thanks everyone for making my French Provincial desk one of the most viewed links last week. And thank you Kathy for hosting such a great party. Thank you very much for hosting Kathy! Have a wonderful week. Computer problems are no fun. Hope yours gets resolved quickly, Kathy. Thanks for hosting the party. When I get a place to live, I'd love to have a library! I have boxes and boxes of books in storage, just waiting for a home! Hi Kathy! Thank you so much for hosting the party! 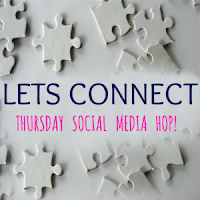 Hope you have a happy Tuesday and a wonderful week!